With the theme “Role of Indian Diaspora in building New India”, Pravasi Bharatiya Divas 2019, is seeking to reconnect Indian expatriates and diaspora with their motherland. The 15th Pravasi Bharatiya Divas (PBD) kicked off in Varanasi, Uttar Pradesh, the cultural and spiritual capital of India on January 21. Every year PBD is celebrated to mark the contribution of Overseas Indian community with the government, to reconnect them with their roots and celebrate their achievements and contributions. This year the three day event (January 21-23) focuses on developing new India with its theme “Role of Indian Diaspora in building New India”. Organised at the Deen Dayal Trade Facilitation Centre, the entire campus has been decorated with the theme of ‘Kashi Culture’ depicting famous ghats, temples and the ethos of the most ancient living city. Inaugurating the event on Tuesday, Prime Minister Narendra Modi in the presence of chief guest, Mauritian Prime Minister Pravind Jugnauth, said that the NRIs can play a great role in start up, stand up, and defence manufacturing sector while working for the development of India. PM Narendra Modi described the diaspora as India’s brand ambassadors and said they were the symbols of the country’s capabilities. He said that the government will help NRIs in every possible manner and has already taken a new step in Passport seva service and work is on to issue chip-based e-passports to Indian citizens under a centralized passport system. He also mentioned about the International Solar Alliance (ISA) and said “through this medium, we want to take the world towards One World, One Sun, One Grid.” Modi The government is going to start Pravasi Teerth Darshan Yojna, under which a group of Indian diaspora will be taken to religious places across the country. The biennial gathering for the Indian diaspora that is celebrated on January 9, was postponed this year “in reverence to the sentiments of the larger diaspora to participate in Kumbh Mela and Republic Day celebrations”, the Prime Minister’s Office said in a statement. Indians make up one of the world’s largest diaspora with more than 25 million of them living in different parts of the world, including in Singapore, Malaysia, United States and Canada. 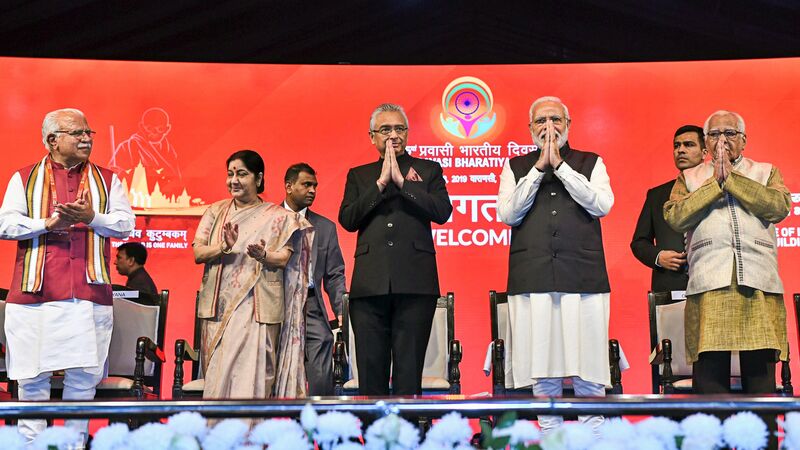 The Youth Pravasi Bharatiya Divas that marked the start of the 15th PBD on Monday seeks to reconnect Indian expatriates and diaspora with their motherland. In her inaugural address, Indian foreign minister Sushma Swaraj said that India’s youth demographic was its greatest strength, offering the country an unprecedented edge over countries like the US, Japan and China that were ageing rapidly. Skilled migrants from India, who number prominently among the 31 million strong Indian diaspora across the world, have dramatically changed the world’s perception of the country and Indians with their achievements, she said on the first day of the event. While referring to India’s youth advantage, Swaraj said by 2020, the average age of Indians would be 29 years, making Asia’s third largest economy the world’s youngest country with 64 pc of the population in the working age group. “While countries like the US (and those in) Western Europe, Japan and even China are ageing rapidly, India is getting younger and younger. By 2022, these ageing countries will become super-aged with over one-third of their population over 65 years of age, while India will have the world’s largest working population. This demographic prospect offers India an unprecedented edge, which could further contribute to building a New Young India by 2022,” she added. The annual event of Pravasi Bharatiya Divas (PBD) has turned out to be the largest and grandest turnout of overseas. External affairs ministry official Dnyaneshwar Mulay, at a briefing, said this was the “largest and the grandest” PBD since its inception in 2003. A total number of 7,228 registrations were done for PBD 2019 from over 92 countries, and overseas delegates were about 5,000. The government has done a lot to promote the PBD convention this year and the results can be seen with the huge number of turnout. “Earlier we used to be happy with turnout of 800 delegates and maximum 1000,” added Mulay.